The House of the Faun, discovered in 1830 in the ancient city of Pompeii, was so named for this bronze, 'The Dancing Faun', which had been buried under ash and pumice along with the remains of the luxurious building since the great eruption of Vesuvius in AD 79. In fact, this is a copy - the original is so precious it is now housed in the Naples National Archaeological Museum, with this exact replica cast from a mould taken of the original by the Chiurazzi Foundry. 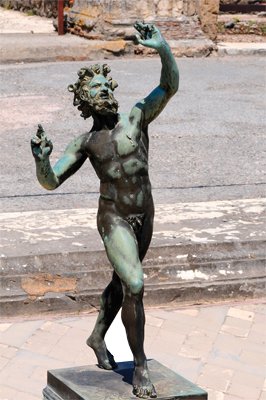 Portraying a bearded, naked male figure, the goat's horns and small tail identify the figure as a faun - perhaps Pan or, more likely, one of his satyrs. With his head thrown back, heel raised and one arm flung up to the sky, the faun appears to be dancing in the throes of Bacchic inebriation - his joyous, sprightly demeanour celebrates the spirit of excess and hedonism sought and seized by wealthy Romans. The statue is a mere 800mm in height and stood at the lip of the atrium's impluvium - a sunken floor designed to carry away rainwater - as the centrepiece of the large garden at the front of the house. The House of the Faun was one of the largest aristocratic residences in Pompeii, and was the site of other important archaeological artefacts such as the Alexander Mosaic. This statue can be traced back to a centre of Greek production, most probably Alexandria, during the late-Hellenistic age, by which time fauns were no longer portrayed with the legs and hooves of a goat, but retained a short tail and horns to identify them as mythological creatures. The Dancing Faun embodies a level of freedom that only Pompeii's privileged few would have enjoyed, though the city's rich and poor would share the same fate in AD 79.